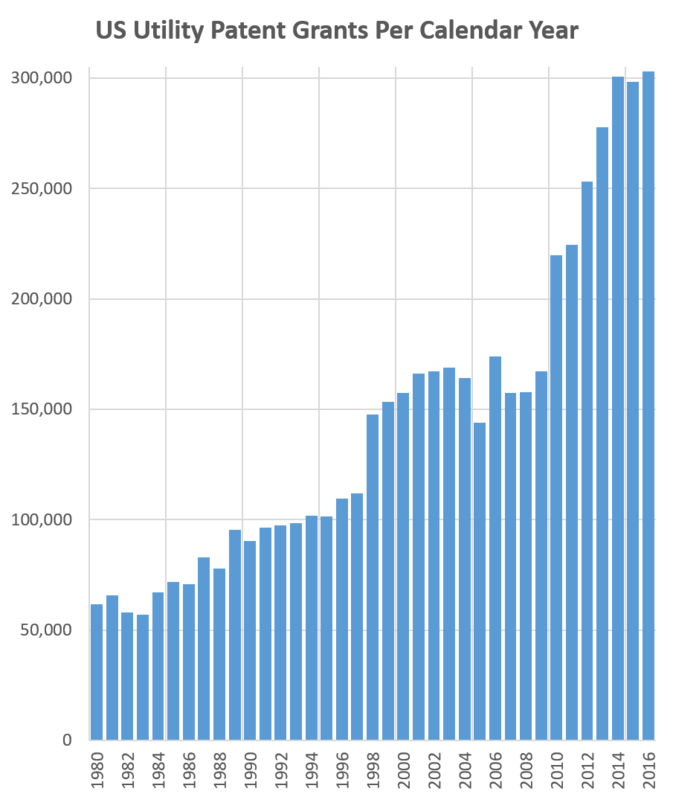 So, if this were normalized for # of patent applications per billions of dollars of the GDP, then the # of patent application would be less now then in 1980. Please. Try. To. Be. Ethical. And if you take out the foreign applications, then probably about 1/3 the number of patent applications are being filed now compared with 1980. It would be nice if law professors felt a need to fairly represent data. If you were in an engineering professor, you’d be removed. That itself is an interesting observation NWPA. And just to be clear, it is my understanding that it is an ethical duty to normalize graphs when trying to illustrate points with the graphs. How these graphs should be normalized may be debated, but no one would debate that they need to be normalized. A good example of unethical conduct is when the AIA came into effect and anti-patent judicial activists did not normalize the number of law suits to account for the fact that multiple D’s could no longer be listed on the complaint. Wasn’t Lessig one of the offenders in this. And, yet, Harvard has put him in charge of an ethics whatever at Harvard. What a joke. And, Jason, how can you look yourself in the mirror and not call out the professors on these issues? I am not sure that “poor graphmanship” rises to an ethical consideration, Night Writer. That being said, I would consider it unethical to simply ig nore comments that one merely does not like when it comes to advocating a legal position or a legal mindset that is connected with shaping law. NW – the graph is issued patents, not patent applications. That is an important distinction here b/c during this entire time there has been a large backlog – so large that the PTO could have doubled-throughput at any point in time and still had thousands more cases to examine. What this means to me is that – at least in short-term studies (year-to-year), the number of new application filings is not really related to the change in PTO output. Have a green “straight line” from 1982 to 2014; and then “pull” the line down with red arrows for the lulls of 1990-1998 and 2001-2010. This would portray a more “normal” innovation curve (in green) and the artificial constraints (in red) which result in a better explanation of the “hockey stick” (in black). I think this is deceptive without the foreign filings. Also, –again–this is not taken in context with the growing importance of technology in our economy and culture and the vast population increases around the world. What do we have something like almost 50% more people in the U.S. from the start of the graph to the end of the graph? If this were normalized for population, foreign filings, and the percent of the economy that makes up technology then it would be a fair graph. As it is, Dennis I really question your ethics. Without understanding contexts (such as the points you present – or the graphics I offered), this is certainly one of those “chum feeders” for anti-patent folks to say that the Office (especially Kappos) was “out of control” and that “there are too many patents” – all of which “feeds” a Supreme Court that “feels” that patents must be made more difficult, even if patents are being obtained according to the (statutory) law as actually written by Congress. To wit: an implicit “wink” that the Ends are justified by the Means of legislating from the bench. My bet is that if this graph were normalized for percent of economy for high-tech (like information processing) and population growth that in 1980 more patent applications were being filed than now. Well Max, the Chinese government apparently subsidizes patent prosecution costs and grants inventors some sort of prize upon receiving a patent. What would you expect? One wonders how IBM can receive 8000 patents a year? I suspect that if one looked closely, inventors inside IBM are handsomely rewarded for filing disclosures and for receiving a patent. Wow! Just Wow. Look at the curve again. But this time with the thought that the by now notorious State Street Bank decision issued in 1998. Is it possible to shade the segments to show foreign-originated filings? Given that there are more “foreign” inventors than “domestic” one might suppose that the % of foreign-owned patents within any jurisdiction is a sign of how “strong” the patent system is in that jurisdiction. So, at the EPO the % of foreign-owned patents has always been around 50% since the inception, in 1978. Conversely, AFAIK, the % of foreign-owned patents in CN, JP, KR is much less than 50%. Technological progress is what we all need, to save humankind from destroying the planet Where should the % level be, folks, for a correctly functioning patent system in an optimally functioning climate of innovation and technological progress? What does that transition look like? For all you pendulum watchers out there. lol. I think it’s okay! As long as there are no frames or pointer animations on the site, it’s all good! Is this animated GIF too annoying to leave on the site? I think a synchronized slide whistle sound, with increasing pitch, would really make it. I didn’t mind it myself, but I do also agree with MM. In fact, maybe add an animation that takes the Kappos “surplus” and fills in the artificially restrained “bite” from the Dudas Reject-Reject-Reject era. I don’t mind the animation per se. Its that it doesn’t flatten out like I think it should during and before the Dudas years…. Actually if you follow the trend it looks like the guy in before Dudas artificially upped the allowance rate. State Street Bank was decided in 1998. Yep that’ll do it. My bad. Innovation begets innovation – we should not expect (necessarily) a linear curve. If you’re trying to achieve parity with the default gravatars in the comments, you still have a ways to go.